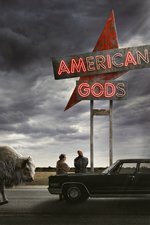 We’re still moving slowly towards the war that is the whole point of American Gods, and though we ended “The Ways of the Dead” in the same place we began it, you get the sense that a lot happened in a short amount of time. “The Ways of the Dead” felt a lot like a Season 1 episode, which could mean that we are finally getting back on track after the showrunner change (Variety). (Of course, knowing that they have changed showrunners again makes you wonder what sort of issues the second half of the season will have.) Stylistically, tonally, this episode was very much a return to form. American Gods is a dark, crazy, fever dream, and multiple points in this episode – Shadow’s dreams, whatever the hell was going on in New Orleans – were like having an acid trip. Orlando Jones just kills it as Nancy and I loved his argument with Mr Ibis. I'm not thrilled about the return to Mad Sweeney and Laura's traveling road show. I did enjoy the inclusion of Baron Samedi who, in the book, appears only briefly in the final battle, but I'm really just over that whole coin storyline at this point. They've milked it enough. They need to actually do something with it. Despite that I enjoyed Brigitte's stinging line that Laura was a cheater in life and now she cheats death. I'm not sure what they are going to do with these two since they've deviated so much from their original storyline. I also wasn't particularly happy with "No one hates the children of Israel as much as the children of Israel" which seems to be entrenched in the "self hating jew" stereotype. The explanation of self hate (why in this case the ghost of a murdered black man would torment other black men) is insightful, but that one line is really unfortunate. This set up Laura to get two drops of blood from Shadow, or some other "blood infused with love," if they're really going to twist the story away from the book. I also wasn't particularly happy with "No one hates the children of Israel as much as the children of Israel" which seems to be entrenched in the "self hating jew" stereotype. What you say also happens to be true for a dozen other ethnicities. But when you are continually reminded that you have little to no value, it's easy to be convinced that all the rules are stacked against you. Your worst fears are not possible; they are probable. But I agree, it's not a good look, especially because it came without any other context or reason for Jewish people to be referenced, and nothing that really ties it back to the book, either. Yeah as I said, the follow up is insightful, but that particular statement isn't necessary. Let's also consider that the Jews were enslaved by the Egyptians (Exodus) so an Egyptian deity referencing Jewish self hate when his worshipers were their first oppressors....not good. In terms of Laura, I suspect they are headed down the Laura/Mad Sweeney fall in love story line (Brigitte hints at it). I mean Baron Samedi says it has to be infused with love, but not whose love or for whom. So hey why not use Salim's blood as he loves his Jinn? I mean I can't imagine finding the blood of someone in love is all that difficult. But I suspect Laura's gonna go for either Shadow or Mad Sweeney. I don't think it would work as anything more than a superfluous setpiece because Wotan is already pretty much playing as the dirty dealing charming tempter, but this show excels in superfluous setpieces way more than it does in moving the plot along in tight and interesting ways. Also jeeeez, Salim is such a poutypants and the Djinn is such a grumpypants... can we get another beautiful makeout scene so they can get their nut off and maybe act a little like they enjoy each other again? But I suspect Laura's gonna go for either Shadow or Mad Sweeney. I think what they’re trying to set up is that Shadow loves Laura-as-she-was, but Mad Sweeney loves Laura-as-she-is. I suspect only Mad Sweeney’s blood will work in the potion - the question is whether Laura will figures that out or not, or will she just use Shadow’s blood without thinking about it.